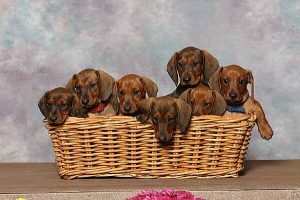 Welcome to our page on the wonderful and distinctive breed that is the Dachshund, here you will find plenty of useful tips from the experts themselves – the Dachshund breeders. Breeder Vicki Spencer of Lorindol Standard Smooths is also secretary of the Dachshund Club of America, and she tells us why she chose this breed above all others: “I began actively showing Golden Retrievers in obedience and conformation in 1970. In 1994 I acquired a Dachshund puppy who became American Dual Champion, Canadian Champion, International Champion Cherevee Bad News Bear VC (Versatility Certificate) JE (Junior Earth Dog) CD (Companion Dog) titling in conformation, field trials, obedience and earthdog. Needless to say I was hooked. 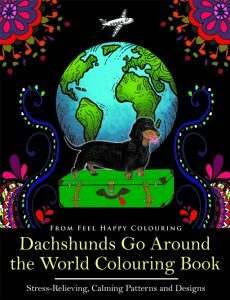 “Why a Dachshund (especially since they are polar opposites from a Golden Retriever)? I love their intelligence, independence and tenacity. Even though they love their people to the nth degree and are extremely eager to please, they have a stubbornness that will keep you on your toes. Being tremendously intelligent, they have no problem questioning your orders if they feel you are being unreasonable. They are free thinkers who can and will figure out solutions to problems on their own. Their stubbornness will keep them on a problem until they do figure out a solution. Historical illustrations from the 15th-17th century show dogs much like Dachshunds used for various hunting purposes. The animals are described as having tracking abilities similar to hounds, but with a physical size and temperament more akin to terriers. As the Dachshund developed as a distinct breed in Germany, their hunting skills expanded beyond their primary function as badger dogs. Dachshunds are excellent trackers, and are still used today to locate wounded deer. Packs of Dachshunds have been used to hunt wild boar, to go after fox and rabbit, and even to work as retrievers of waterfowl. This is the largest sized Dachshund with a typical height of 8-9 inches (20-23 cm). A mature standard Dachshund weighs approximately 16-32 lbs. / 7.3-15 kg (USA breed standard). Standards come in comes in three different coat varieties — shorthaired (smooth), longhaired, and wirehaired (as explained further in this chapter). Miniatures are of course smaller in size when compared to standards. They must weigh a maximum of 11 lbs. / 4.98 kg (this is when they are 1 year old), and are usually 5-6 inches (13-15 cm) in height (USA breed standard). Miniatures also come in the three different coat varieties — short-haired (smooth), long-haired, and wire-haired.